Visitors to Tuscany frequently head to San Gimignano to see the “Medieval Manhattan” – a town of high-rise buildings built in the 11th and 12th centuries – but a couple visits is enough for me. The views are great and the towers are fantastic, but it’s all too easy. I’m more intrigued by the hidden towers of Florence. Where San Gimignano had 72 towers, 13 of which remain and easy to find, Florence was a walled city of over 300 towers and all or part of over 100 towers still exist, but most are a challenge to find. Why towers? In a world without elevators, wouldn’t a classic two- or three-story house style with rooms been easier to live in? The skyscrapers of modern cities are the answer to a space issue. The towers of medieval Florence were a safety solution. In the year 1215, when Gherardo Orlandi was podestà of Florence, Buondelmonte dei Buondelmonti promised to marry a young woman from the house of Amidei, honorable and noble citizens. Later, as Buondelmonte, a graceful and skillful horseman, was riding through the city, a woman from the house of Donati called to him and criticized the marriage agreement he had made, saying his betrothed was neither beautiful nor fine enough for him. “I’ve been saving my own daughter for you,” she said, and showed the daughter to him. The daughter was very beautiful and immediately with the devil’s connivance, Buondelmonte was so smitten that he married her. The first girl’s family met together, smarting from the shame Buondelmonte had placed upon them, and they were filled with a terrible indignation that would destroy and divide the city of Florence. Many noble houses plotted together to bring shame on Buondelmonte in reprisal for these injuries. As they were discussing whether they should beat or wound him, Mosca dei Lamberti spoke the evil words, “A thing done has a head,” that is, they should kill him. And thus it happened, for on Easter morning the Amidei of Santo Stefano assembled in their house, and as Buondelmonte came from the other side of the Arno nobly attired in new, white clothes, riding a white palfrey, when he arrived on this side of the old bridge, precisely at the foot of the pillar where the statue of Mars stood, he was pulled from his horse by Schiatta degli Uberti, assaulted and wounded by Mosca Lamberti and Lambertuccio degli Amidei, and finished off by Oderigo Fifanti. They had with them one of the Counts of Gangalandi. As a result, the city was thrown into strife and disorder, for Buondelmonte’s death was the cause and beginning of the cursed Guelf and Ghibelline parties in Florence. To be sure, there were already divisions among the noble citizens, and these parties already existed because of the quarrels and disputes between church and empire; yet it was because of Buondelmonte’s death that all the noble families and other Florentine citizens were divided into factions, some siding with the Buondelmonti, leaders of the Guelf party, and others with the Uberti, leaders of the Ghibellines. Later, with the formation of the political parties of the Guelphs and Ghibellines, the familial factionalism morphed into warfare between neighborhoods and eventually drew cities across Tuscany into famous battles involving tens of thousands of soldiers, many of them mercenaries. The tower design was the method used by wealthy Florentines to provide family security. They were made of small hand-cut stone “brick” walls up to six feet thick. They were typically about 15 to 18 feet along the horizontal sides and could climb up to 200 feet vertically. The towers embodied the family’s power, and had to be built taller than the ones of enemy clans: many towers collapsed during their construction because the owners wanted them to be too tall. The number of towers a family owned also signified wealth and clout. In the story of the family feud above, note the name Uberti. 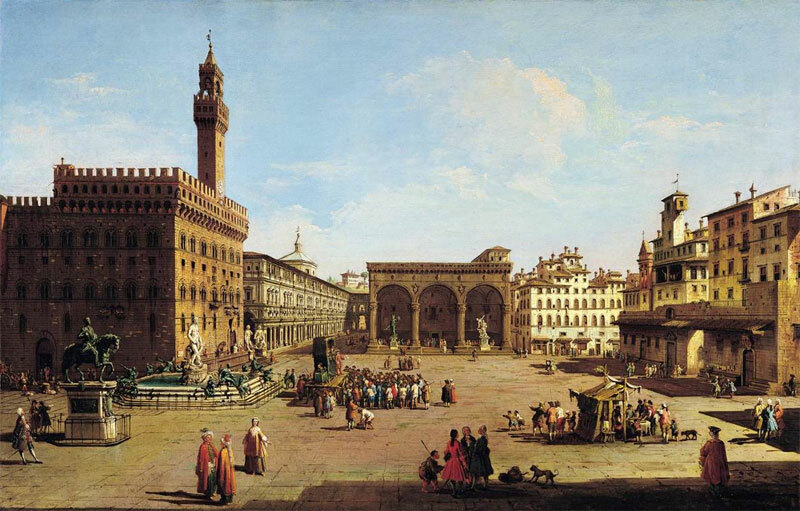 The Uberti clan built a number of towers in what is now the Piazza Signoria. They supported the Ghibelline cause. When the Guelphs defeated the Ghibellines, the Uberti family towers were torn down. The reason the Palazzo Vecchio is off-center in the piazza is that the city government determined that the city hall “should not have its foundations in any way whatsoever on the land of the rebel Uberti.” (Villani) Instead the city bought another family (Foraboschi) tower, which was about 100 feet high, know as Torre della Vacca (Tower of the Cow), for use as the bell tower (and later, prison) on the Palazzo Vecchio. Torre di Arnolfo was first the Foraboschi family tower. The extreme violence unleashed by the factions within the city led to the destruction of many towers by both sides (the Ghibellines destroyed over 85 Guelph towers; then the Guelphs returned the favor by destroying even more built by their rivals). 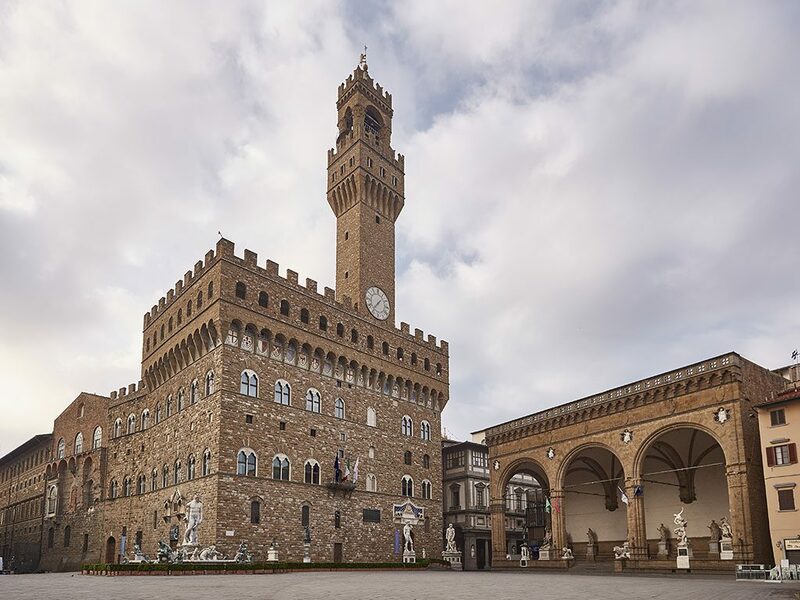 In future posts I will introduce some of the more hidden towers, but the family tower that is hiding in plain sight is the tower of the Palazzo Vecchio once owned and used by the Foraboschi family, surrounded by the ghosts of the Uberti clan towers. It is special because it is the only tower left in Florence that gives us an idea of the height of the the original private towers. Another benefit is that it is a tower that visitors can climb.